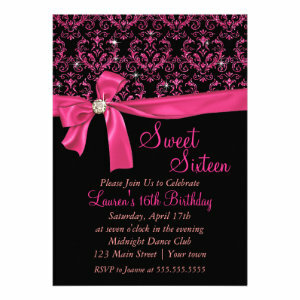 Are you looking for some glitzy and glamorous sweet sixteen invitations? Then treat your teen girl with these sparkling "sweet 16" announcements. 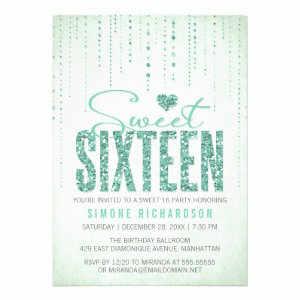 Below you can find some of the most classy and glamorous, sparkle "Sweet Sixteen" birthday invites out there! Every design can be easily personalized to fit your demands. Start your 16th Birthday celebrations off in style by sending your guests a beautiful personalized party invitation. 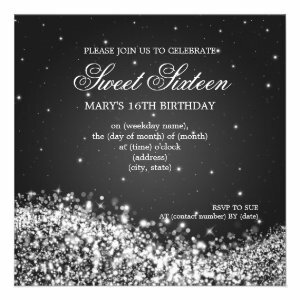 Our gorgeous Sparkling Sweet Sixteen Party Invitations come in lots of different styles and designs. Find pretty floral invites, sophisticated and elegant diamond announcements and the most adorable sweet sixteen party invitations perfect for teens. We all know how important your 16th birthday is, especially when that sixteenth birthday is yours. It should be something that your kids remember throughout their lives. But before you throw the grand party of their dreams, there must be a unique way of letting people know about it. These birthday announcements aim to put some elegance and fun into the birthday festivities. 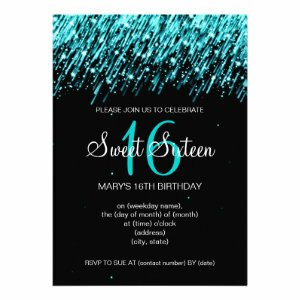 All of our Sweet Sixteen birthday invitations can be personalized so you can add that extra special touch for your guests. You can easily customize the text, font style, colour, and design to your taste. 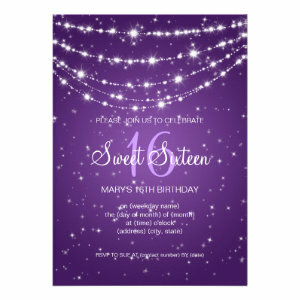 If glitz and glamour is what you're looking for then these Sparkling Sweet Sixteen Party Invitations are sure to add a little extra touch of elegance to your celebrations.